Hi Ladies! I saw this tag on one of my favourite blogs - Coture Girl, If your a blog lover I'm sure you will have heard of this blog as its amazing! 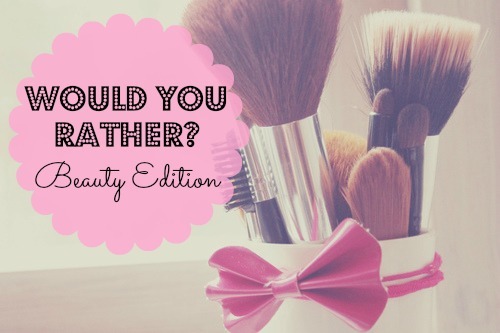 Its basically a game of would you rather except all of the questions are beauty related. It doesn't need much introduction, so I'll just jump straight in. This one isn't really hard for me, I am a lipstick obsessor and my collection is slowly growing but I've only recently started to love eyeshadows and learnt which colours work together so my collection of eyeshadows isn't too large at the moment so I wouldn't be loosing to much. Also, Its not like I would be giving up eyeliner and mascara so my eyes wouldn't be bare! Hmm, although if I didn't ever cut my hair again I'd end up with a very long mane eventually when my hair finally decides to grow with loads of split ends, I couldn't cut off all my hair, I hate going to the hairdressers purely because they always cut too much off and I've never found one who listens to what I actually want, so going in and chopping all my hair off would be a nightmare for me! I would definitely go with a pink blusher, most of my blushers are pink and I think there's much more variety of pink blushers around than coral. I currently only have one coral blusher and I only ever really use it when I've got a tan because I think sometimes it doesn't suit my very pale skin. And I hardly ever have a tan so I think I could get away with pink all year. Although I am a great lover of make up and my wishlist is currently larger than me, I think I would have to spend it on clothes. I don't really buy clothes that often and I really do need a wadrobe revamp, and especially to get more work clothes but I find that I have quite an expensive taste so I can't really get all the clothes I want all the time. I wouldn't like to do either, I can't imagine liking either texture where they aren't meant for but if I had to choose I would wear eyeliner on my lips. You can get so many shades of eyeliner now from some make up brands so I think you could get your hands on a colour that would look good on your lips, but I don't think any of my lipstick colours would look nice anywhere near my eyes, and I imaging it would feel quite sticky, not a nice feeling for your eyelids! 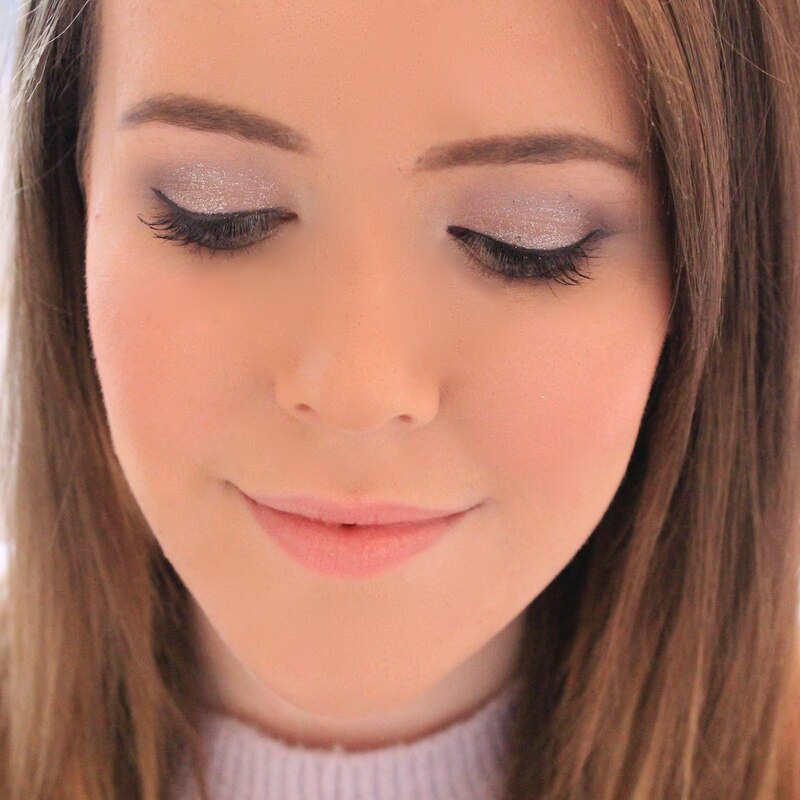 We don't have a Sephora in the UK (So sad, I know!) but I think if I did live near one I would probably choose Sephora, from what I gather, there's loads of different brands and you can get a wide variety of make up there but I think If I could only shop at Mac I would get a little bored, even if it is one of my favorite brands. I think I would rather wear one lip colour, even though my lipstick collection is growing I do tend to use the same kind of shade for everyday use and I think you can easily wear a muted lip when going out and it will go with all eyeshadow looks, but my eye looks for day to day and going out are quite different so I would have to go with just one lip colour. I think I would rather wear winter clothes in summer. Just because here in the UK we never really get a proper summer, so I reckon I could sweat it out in my winter clothes for a week whereas wearing shorts for the months on end of cold weather would be terrible, I think I may actually die if I tried that this year, if last winter is anything to go by! I think I would have to go for bright nails. As much as I love them, dark nails don't really suit me at all! Definitely my favourite eye product. I don't wear eyeshadow everyday whereas I can't finish my make up without adding some sort of lip product, so losing the eye make up wouldn't be as distressing as losing my lipstick! I think I would go for a ponytail. You can have loads of different ponytails - high, low, messy, curly, straight, etc. So I think having a ponytail would give me more options with my hair whereas a messy bun is only really one look, and I'm not very good at doing a messy bun! I'd rather not paint my nails again. You can always get stick on fake nails or acrylics done and that technically isn't painting your nails and they would still look nice! Both of these options are horrendous, Imagine how funny my face would look with no eyebrows or with ones drawn on with a sharpie?! But I think the lesser of the two evils in this case is the sharpie. I guess I could get a thin brown sharpie and try and make it work? This is an easy one for me. I would 100% rather live without nail varnish. I'm so lazy when it comes to my nails, unless I've had them done, I can usually be found walking round with chipped and bitten nails because I just can't break the habit. Whereas I love my make up and I don't think I'm lazy with that. I hope you liked this post and If you do this tag yourself don't forget to either comment and let me know or tweet me (@RDerbyshire93) and let me know so I can have a read! Some of these were quite tough to answer so I'd love to know if you would choose the same! Love this kind of post!! :) I really want to do it too!! I really enjoyed reading this! :) your blog is beautiful! Great looking blog Becky and lovely getting to know you via this post! Great post! I loved reading this and love your blog! Such a fun tag! Really like all of your answers, so fun to read! I'd definitely wear winter clothes in summer too! Love this post, so fun.